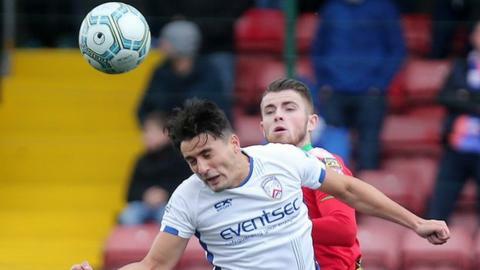 Coleraine defeated Cliftonville 2-1 at Solitude to remain unbeaten in their 11 league games and stay five points clear at the top of the Irish Premiership. A David Ogilby free-kick put the Bannsiders ahead, Rory Donnelly equalised, but Joe McCready poked home the winner two minutes after half-time. Andrew Mitchell scored twice as second-placed Glenavon saw off Ballymena 4-0. Ballinamallard earned a first win of the campaign by beating Carrick Rangers 2-0 and Glentoran beat Dungannon 2-0. Curtis Allen nipped in front of his marker to nod home in the third minute in the day's late kick-off at Stangmore Park, while Calum Birney bundled in at the back post from close range on 11 after the home side failed to clear. Glentoran go fourth, level on points with third-placed Linfield. Coleraine took the lead in the 10th minute thanks to central defender Ogilby's 25-yard effort which flew around the wall and into the bottom corner. Donnelly slotted home the equaliser on 21 minutes but McCready's decisive strike ensured that Cliftonville's record of six successive wins in all competitions came to an end. Reds midfielder Liam Bagnall was sent-off for a second bookable offence in the closing moments. Glenavon ran out 6-1 winners when they played Ballymena United at the Showgrounds in August and backed up their record as the league's highest scorers by hammering the Sky Blues 4-0 at Mourneview Park. It took just seven minutes for the hosts to go in front when Mitchell drilled in a cross which goalkeeper Conor Brennan diverted into his own net as he attempted to catch the ball. Twenty minutes later the Lurgan Blues striker controlled and turned 20 yards out before rifling into the bottom corner to double his side's advantage. Bobby Burns got in on the act in the 32nd minute, dispossessing Michael Gault and sprinting clear before slotting across keeper Brennan. Mitchell slid in to get a touch but the ball appeared to have already crossed the line. Ballymena defender Kyle Owens was shown his second red card of the season by referee Arnold Hunter soon after for a reckless challenge on Burns and then Andrew Hall made it four with a long-range free-kick which flew past Brennan. Marshall squandered a good chance to add a fifth when he headed over in a much less eventful second half. Ballinamallard went into their encounter with fellow strugglers Carrick having only registered one point from their first 10 league games of the season. Matthew Smyth sent Gavin Dykes' men on their way with a powerful header from six yards in the sixth minute after Ross Taheny had headed across goal from Richard Clarke's free-kick. Jonathan Leddy grabbed the second with a low drive from 30 yards which found the bottom corner just after the half hour mark. A disappointing day for Carrick was compounded 10 minutes from time when Mark Edgar was dismissed for a rash challenge on Shane McGinty. The Mallards are three points adrift of Warrenpoint Town at the foot of the table and five points behind 10th-placed Carrick.